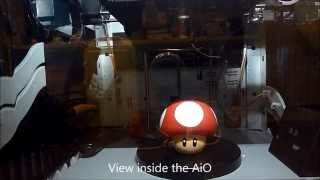 The da Vinci 1.0 AiO 3D printer combines a 3D printer and a 3D scanner at a price that's less than many 3D printers alone. 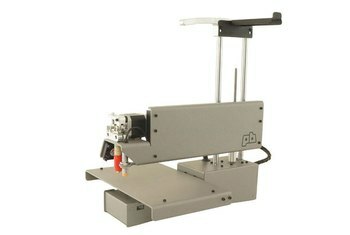 It has a large platform that can print a 7.8 by 7.8 by 7.8-inch cube at various resolutions. With auto-calibrate, the da Vinci AiO is ready to go right out of the box. 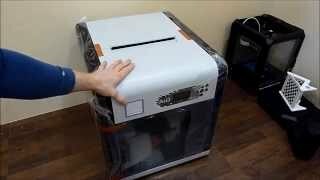 The non-removable print bed makes it difficult to clean the printer. 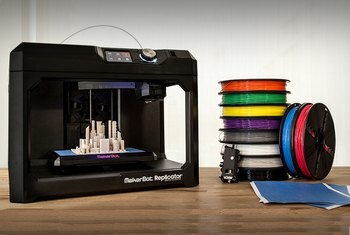 You can't swap filament for multiple colors during a print job. The built-in scanner has difficulty with shiny or high contrast objects, or objects with an X, Y, or Z axis that is less than 2 inches. The company suggests some workarounds. 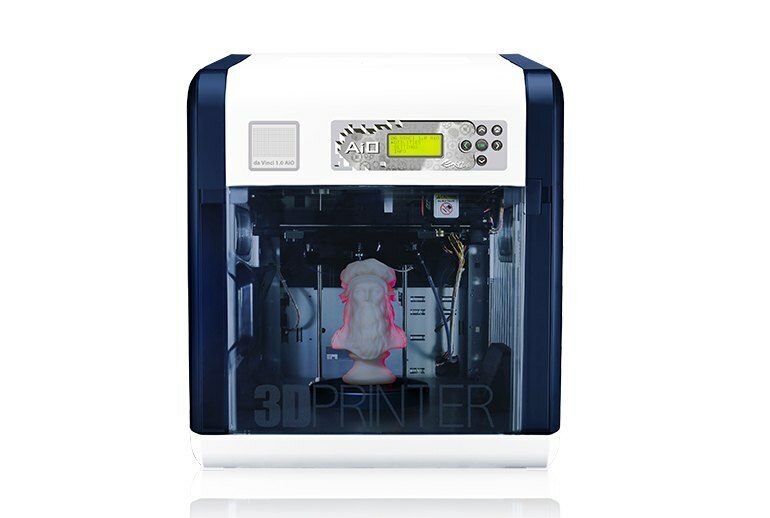 The da Vinci 1.0 AiO 3D printer from XYXPrinting combines a 3D scanner with a single-extruder 3D printer. 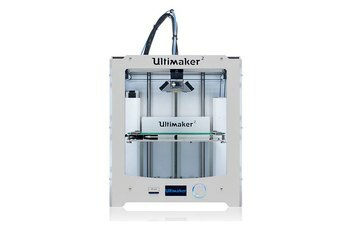 Connect it to your computer with USB 2.0, and the automatic calibration gets you set up quickly out of the box. 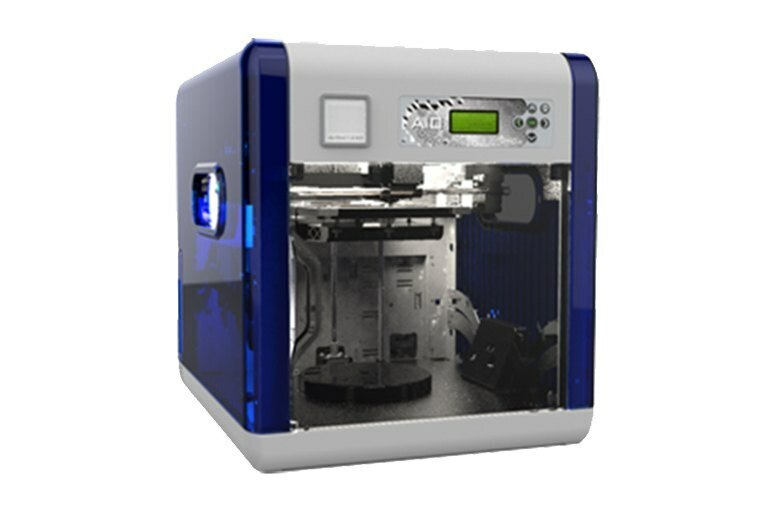 The da Vinci AiO--or All in One--uses proprietary PLA and ABS filament and a large heated build platform to print objects up to 7.8 inches cubed with 0.1 mm to 0.4 mm resolution. With the 1-megapixel camera, two laser sensors, and a rotating table, the da Vinci AiO scans 3D objects using proprietary software and saves the scan in STL file format for replication. 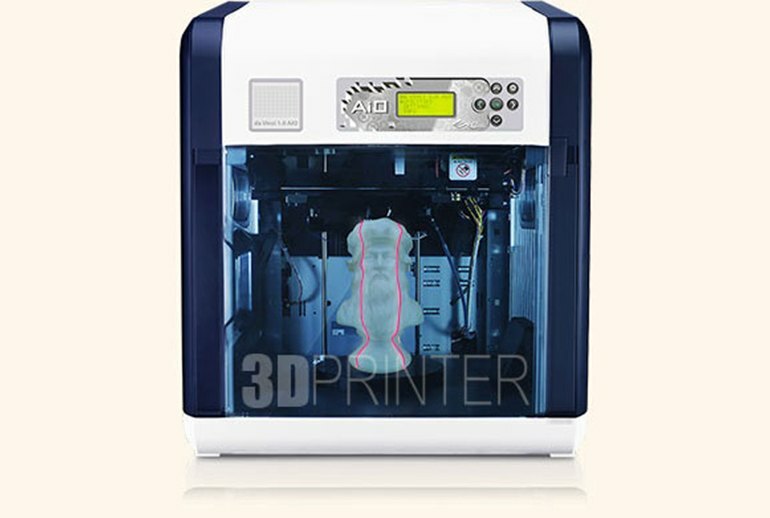 Right away, the AiO 3D printer grabs your eye with its refined appearance. If you're interested in, or even just curious about, 3D printing, the Da Vinci 1.0 AiO is an easy recommendation. 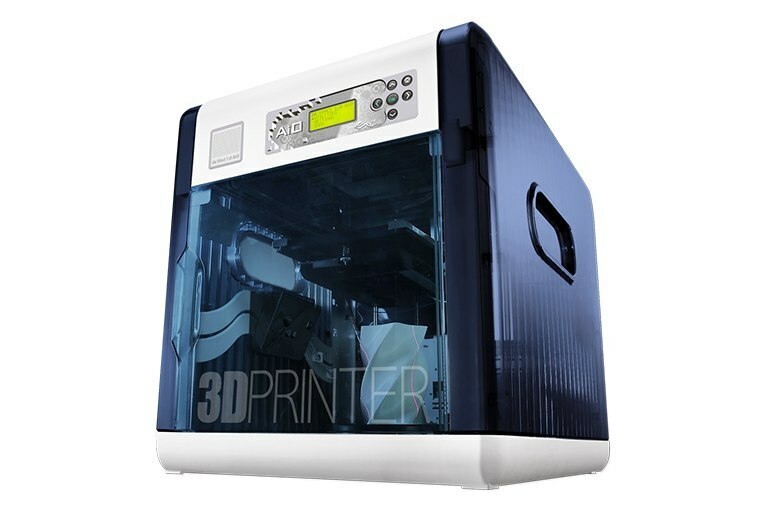 If you’re considering purchasing this for a child or a classroom, keep in mind that XYZprinting’s complete enclosure of the printing and scanning elements of this AiO, goes a long way toward keeping curious hands out of danger. 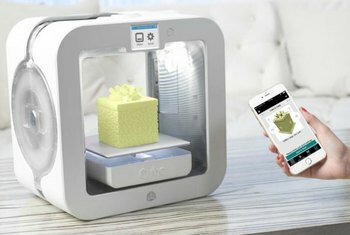 XYZprinting's Da Vinci is a 3D printer that removes much of the mystery surrounding the print process, and unlike many other printers is ready to use within minutes of being removed from the box. 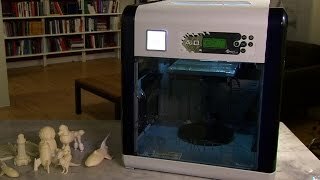 Plenty of all-in-one printers can scan, fax and print, but an all-in-one 3D printer is a horse of a different color. 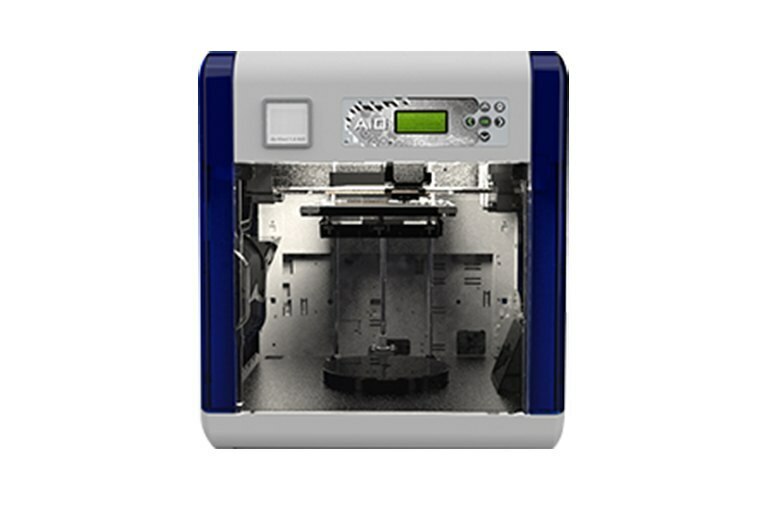 It also carries with it features from XYZPrinting products such as nozzle cleaning, the smart filament cartridge, and, for the worrywarts, one year free warranty. XYZPrinting is the first to incorporate scanning into a consumer-grade product. Except for a test object XYZprinting supplied for testing, few of my scans came out the way I hoped, with most suffering from ugly discontinuities and long unintended extrusions, as if the whole object was made of wet taffy. It is literally a 3D copier with true object-in/object-out systems. In short, it is a Star Trekian replicator – within reason. The idea is simple: Put an object in, scan it, then print out a replica. This was my first real hands-on experience with a 3D printer, and I've had a great time printing. This printer is supposed to also be a 3D scanner though, and I found that it's abysmal on that front. It has never scanned anything -- literally anything -- in a way that's useful. I'd go with a printer-only if I were doing it again.